Yesterday was the first time Free Family Homestead attended a farmer's market as a vendor! It was beyond exciting and nerve wreaking leading up to the start time. We had decided to test the market in our area for the soaps and laundry sauce I make. The three scents that won were: lavender, peppermint, and citrus. As with any outing with three babies, it was stress filled trying to get naps finished, car packed and everyone fed before going to get our both set up. Once out there, we set up our table and sign and waited for the organizer to come over so we could pay our fee. My amazing husband came up with a wonderful idea to use a picture frame as a sign for our product and prices. I pulled some of our fall decorations out to draw attention to the sign and then we waited. It took a good hour for the crowd to pick up but once it did, it got very interesting. We had quite a few sales of soap bars and 1 jar of laundry sauce sold. I couldn't have been prouder. Now this market lasted from 2-6pm, my biggest challenge was how to keep the kiddos entertained for four hours in a parking lot with not a lot to do. First we started with the great cricket hunt. Conner is starting to show an interest in everything creepy crawly so I had him scour the lawn for the biggest cricket he could find. With it being October the pickings were slim so that game only bought me about an hour at best. Luckily, a lady with her 2 year old daughter stopped by and let her daughter play with out kids. She said this beat the playground and I had no complaints as they were entertained for yet another hour. By God's grace as soon as the little girl and her mom had to leave, a teenage girl came over and started playing with Miranda, which quickly turned into with Conner too. She was getting along so well with them that I asked if she did any babysitting. Turns out that she did and she teaches VBS, jackpot. Once she had to leave, I was forced to break out the big guns, crayons and coloring books. That got us to the end of the show with some very tired babies. Jasper was there too but he slept the whole thing. All in all, this was a great first time experience for us. Our product sold, I found a babysitter for that ever elusive "Date Night", and we made some friends. This was the last show of the season but we will definitely be there next year every other Friday. I am hoping to expand our inventory to include Rosemary Mint and Ginger scents. I have not bought laundry detergent since Bush W was president. No, we aren't grungy people, not do we buy new clothes every time our clothes get dirty. When I did buy laundry detergent, we went through a jug every 2 weeks or so with just my husband, son, and I. Any mom who has ever perused the laundry aisle knows that kind of usage translates into huge spendings. So our solution, make it ourselves. Like most people I read about while finding my method, I started with the Duggars. If you don't know them google them, they are a Christian family of 22 living debt free and with out any government assistance. They have a recipe on their Web site that works great, however i looker my laundry to have some fragrance. 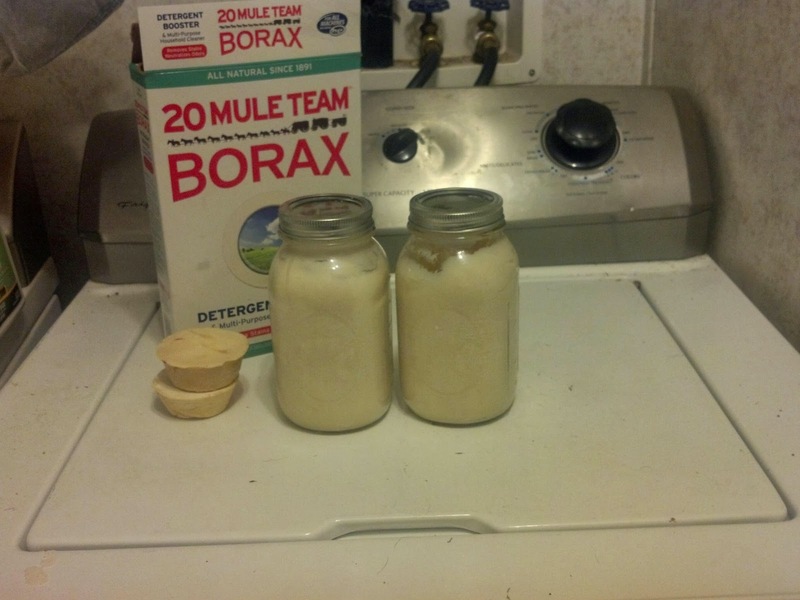 After doing a lot of research, all homemade laundry boil down to three ingredients: bar soap, borax, and laundry soda. For the bar soap, most recommend Fels Napa or Zote, I use two bars of my goat milk soap. The recipes break down to 1 grated bar, 1 cup and 1 cup. Boil the grated bar in approximately 4 cups of water then add the powders and mix completely. Now this makes an extreme concentrate so here is where the recipes vary. In this house we split the mixture into two quart size main jars and fill the rest with water. After about 3 hours I mix the mixture again to turn it into a smooth sauce. It only takes a tablespoon per load. We get about 68 loads a jar so not too bad. The real reason anyone might do this is cost. This recipe cost us about $0.95 a batch the last time I crunched the numbers. (I'm sure it's gone up, thanks economy) and it lasts us about a month. Now that is a lot better than the $30 ish I was spending before. Now the does it work aspect is a big yes. We are a homestead family which translates to a lot of out doors time. Also 3/5 of this family are children/toddlers, and they are very hard on their clothes. If you are looking for some where to pinch some pennies, this would definitely be a good place to start. It cost next to nothing to try it out which is the best selling point. Good luck and God bless. With three babies under 4 years old, sleepless nights are bound to happen. When your husband works nights, they trend to happen more often. Last night, my children planned a mutiny on me. Conner kept getting out of bed, Miranda tossed and turned with an upset tummy, and Jasper was just fidgety. Between the three if them I was able to fall asleep around 11:30pm and was awaken promptly at 12am. I'm not a happy camper at all. When these nights start happening fairly often there are a few things I try to remember but am not always successful. First i have to remind myself that they are growing children. Even though I'm with then 24/7, I often forget that these are small children I'm dealing with. They don't yet have the mental capability to articulate what's wrong with them. So, with very little to no sleep i have to think quicker than Sherlock and Watson to get these babies feeling well enough to go to sleep. Next I usually have to remember that these tiny children are tired too. They played super hard all day and want to sleep but can't. I have finally figured that when tired, children tend to choose fighting the sleep instead of giving in. This world is still new and exciting, there it's nothing worse than missing something. Luckily, we have an amazing bed time routine. That's all i got for this issue: dinner, bath, tea and story time, bed. When all else fails, I go crying to my husband for a day, which translates to maybe 2 hours. God bless him, but most times mommy does it best. During my "day" I get to shut my door and lay down while Daniel runs defense to give me some time to breath. Those few hours gives me back my positive perspective on life. So to all my sleepless moms just wishing for a ray of hope, I hope this helps you find some peace. You are not alone. It is so interesting watching my children play every morning after chores but before it gets too hot. Conner is at the age were his imagination is starting to kick in, and he is so vocal about his play and what her his doing. His sister, Miranda is also starting to play with him. She doesn't always get the game but she is right in the middle of it. Well, unless a rock is more interesting. The game to day is dirt. Conner is using his shovel to fill a bucket with dirt. Then he runs with the bucket to the drive way and pours the dirt out. This is followed by packing the dirt down with the shovel. The process repeats several times, it's hard work but someone has to do it. This game is only topped by climbing the "barn" I built for him to keep his bike in. It's a simple structure made by screwing 4 pallets together. Once the dirt gets boring, he scales this building and truss to forge the coolest/scariest way to get down. The best way so far is climbing half way down and jumping. I absolutely love that my children enjoy playing out doors and use their imaginations. They remind me of how innocent childhood can be. To be alter to pick up a stick and it be a bow or a gun to play cowboys and Indians, to be able to marvel at the colors of a butterfly's wings, it's truly amazing. After an amazingly busy, jammed packed spring and summer, we made it to my favorite time of year, back to school time. Yes, I am that crazy person that gets excited over notebooks and planners. I get giddy over new highlighters and binders and desk organizers. It means that life should be settling down back into a routine and no major surprises. It also means that it is time for me and Conner, my oldest, to start putting school back into the day. The great thing about homeschooling my kids right now is everyone is under five years old, which translates to a lot of playing and learning though playing. Also I haven't gotten to the point where I have to notify the school board of homeschooling intentions. In Mississippi, I have to give written notice that my kindergarten age children and up are to be home schooled and what curriculum I intend to use. Since we are still a young household, most of the day I am un-schooling my children. I mostly talk with them about our daily life and let it go from there. Most of our learning comes from being outside. Conner's vocabulary is expanding exponentially right now, so as we talk, I correct him on his sentence structure and phrasing so he is more comprehensible. He gets really excited when he finds a new caterpillar or colored leaf, and begins stumbling over his words. I gently encourage him to slow down and think about what he is saying. It does get down right amusing when he memorizes songs that he hears. His dad is a big fan of Pit Bull and Robin Thicke, so I am always giggling about what lyrics he thinks he is hearing. My second child, Miranda, is only 18 months, but even she is learning every day. She is very much in the middle of everything. Her favorite thing is to help in the kitchen. She has her stairs to get up to the counter and her rag for wiping messes up. She is also my go for girl. She is at that age where simple requests are finally understood and she preforms them fairly well. I can ask her to bring me diapers for her baby brother and she will for the most part. This year, I am starting to add more structure into our day. In the past, before the third pregnancy, I had started a preschool curriculum with Conner called Letter a Week, it's a free online curriculum and even has baby and toddler curriculum on there as well. I left the web address at the bottom of this post. I hope to reinstate that curriculum, as Conner seemed to love it and I hope to incorporate the other programs offered with my younger ones to give them a head start if they show an interest. Interest is the key to homeschooling, it is the keystone to if this will work or not. With all of my babies still being very young, I don't have a large window of opportunity for attention time for structured learning. If I spend too much time trying to get them to sit still and behave then they are learning what I put together for them. It took a lot for me to get to that revelation, even with everyone giving me advise on the subject. Well, this story comes a little late as everything has been a whirl wind of excitement since the birth of our third child, so here it is. I started having contractions that morning and monitored them with one of the many apps for contraction timing. It felt like false labor for most of the morning, but come that afternoon I was sure it was time to call my Midwife to get her on the way. It turns out to be true what they say about labor getting quicker with each baby. No sooner that finishing dinner, my contractions got more intense and frequent, luckily just as my midwife was pulling into the driveway. I had planned on a water birth or just labor with this pregnancy but one very vital thing hadn't happened for me to be able to get into the tub until after the midwife showed up, my water hadn't broke on its own. I was left pacing my room and bracing on the wall while the debate of tub or no tub waged. We were also strapped for hot water since the kids had had their baths and the dishes had been washed, my mother in law began to warm water on the stove. Eventually, I was allowed to get in the water and it was a complete relief. The heat and weightlessness was a God sent and gave me the breather that I needed for what was to come. After I was settled in the water the urge to push became very urgent. Humorously, every time the urge to push came I would yell, "Pushy feeling", which everyone got a kick out of. It was the only way I could think to communicate what was going on with my body. The midwife checked me and I was just shy of fully dilated and she said what seemed like the stupidest thing in the world to me at the time, "Don't push." Are you kidding me! I'm not trying to push, my body is. How do I stop something I'm not choosing to do? My midwife is also trained in hypnobirthing which I was unable to remember at the time, and she literally stared me down and forced me to breath through each contraction. My poor husband tried to comfort me but at that point I was in a to the death staring contest with the midwife and there was no breaking it. Oh, water still hadn't broken yet. Finally, this crazy lady staring me down concedes and allows me to loose control and begin to push. Once, I felt my baby drop into the birth canal, it was a no holds bar, I was getting this human out of me ASAP. It took two, count them, two pushes to deliver my third child, our second son into this world. What I was later told was if my midwife hadn't ruptured the sac on my final push, my son would have been born without his water breaking. This rarely happens, mostly because rupturing the amniotic sac is a means of starting labor, so I was really amazed that my child almost did this. Once he was out and placed on my chest, I was amazed at how tiny he seemed. At seven pound four onces, he is my smallest birth so far. We named him Jasper Wyatt. If you have any funny or quirky labor stories I would love to hear them. So sorry to everyone that reads here, quite a lot has been going on that has kept me from posting. One of the main things has been baby three growing by leaps and bounds and keeping me very tired. Lucky, I have mastered a bed time routine for my two babies that has been working wonders. Firstly, we have moved to making freezer meals to cut down my time in the kitchen. This is pure genius for moms of more than one kid and i highly recommend it. In fact i plan on writing about it soon with some of our personal favorites. Secondly, we have moved dinner time up from 6pm to 4pm. This came about mostly so my husband can eat dinner with his family before going to work. This also became beneficial as I noticed my 10 month old was getting hungrier earlier due to growth spurts. For the most part every one eats fine, except Mr. picky eater 3 year old. He is the worst when it comes to meals. If it's not bread or chicken, he doesn't want much to do with it. After hubby hours to work, the kids go to Bath time together. They get to play with their toys and soak in a home made bath soak. I make up the mixture ahead of time in sandwich bags and dump it into the bath water each night. It's 1/2 cup Epsom salt, 1/2 baking soda, and 10 drops lavender essential oil. After about 10-30 minutes they are tired and smell amazing. Baby girl gets out first and is rubbed down with coconut oil before getting pajamas. Next, big brother gets the same treatment. Every one in the house is sensitive to commercial lotions so we love our coconut oil. Once pajamas are on, we all cuddle on the couch to watch a movie. As everyone starts passing out, I start moving them to their rooms. This has been the biggest hurdle as my oldest has co slept with us since birth. Baby girl from day one has slept better alone so no issue there. Moving the boy out was a different story. About the only thing that worked was letting him cry about it till he passed out. I don't like doing it but now her willing goes in to his own room to sleep and it is great. Sometimes, he needs me too lay in there with him for a bit but not for too long. Now that i have gotten my bed back it's beyond amazing. By sticking to our new routine i now get a full nights rest and am better prepared for the day. I highly recommend a routine for little ones and big ones. Speaking for my crew, they love knowing what to expect. They know that after daddy leaves, they have so long before bath and cuddles with mom. It's wonderful. I hope that i will continue to find time to post too, i miss it. First of all welcome, my husband and I run the Free Family Homestead in North Mississippi. We are just starting out and are able to start living the way we have always dreamed. We currently only raise meat rabbits NewZealand whites and Dutch rabbits, but are hoping to branch into dairy goats and cows, chickens, and pigs.